A few weeks back, I had the privilege to attend the Tommy X Gigi Show in Venice Beach. (Hopefully you followed along on my insta stories.) It was my first fashion show and I am hoping more designers start bringing their presentations to the (cough) best coast. 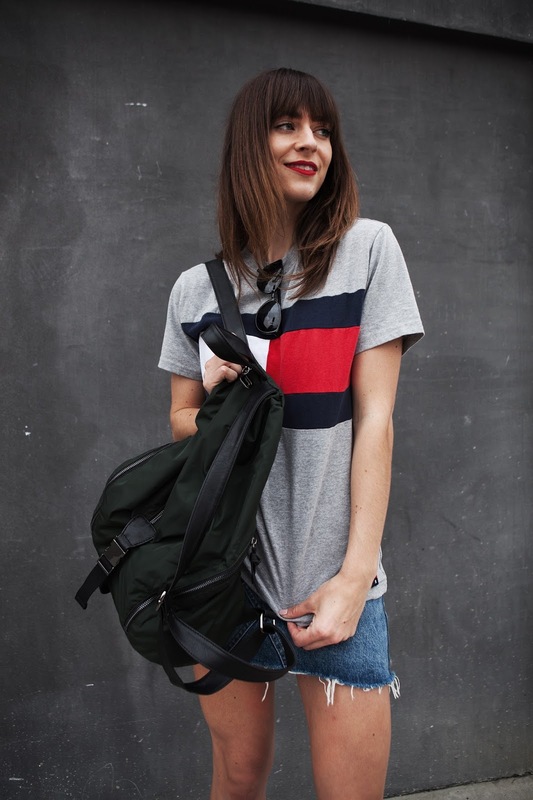 The collection was California classic and with a dose of that Tommy Americana vibe. My favorite pieces included the Bomber Jacket, the yellow Polo Shirt, and the patch-work Denim. The vibe was bright + playful, and all in attendance were dancing in their seats while the models came down the winding runway. Oh, and Lady Gaga stood next to me for a minute (And if you know me, you know she is my teenage-self idol). I walked away so inspired- it only solidified my desire to attend New York Fashion Week in September. Whose going LA babes? 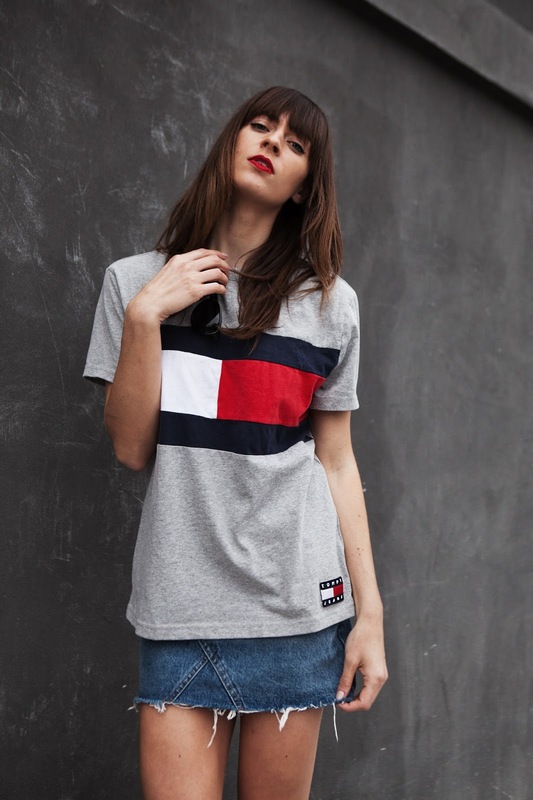 Big logos of the 90's are popping up everywhere in street style trends. From Gucci to Gap- labels are not holding back on flaunting their brands. This is a version of the look I wore to the Tommy show. I got this vintage-inspired tee from Urban Outfitters. I wanted my look to pay a little homage to the brand, and also poke fun at being a millennial. This t-shirt is actually from the men's section. I notice I am more drawn to the cuts and silhouette of men's t-shirts. On a daily basis, I am mostly likely wearing at least one piece that isn't from the "girls" section. But really who follows those structures anyway- especially in fashion. As it warms up, I am thrilled to start showing some leg off. I feel most confident in a cute mini skirt and block boot. Honestly, this is me pretending to be the off-duty, tom boy model of my dreams. H&M Wool Trench Coat, Tommy Jeans for Urban Outfitters T-shirt (I am wearing the Men's version but its sold out online), Topshop Mini Denim Skirt, Zara Boots (Similar to here), Fabletics Backpack, Ketts Co Sunglasses, Sephora Cream Lip Stain in Always Red.